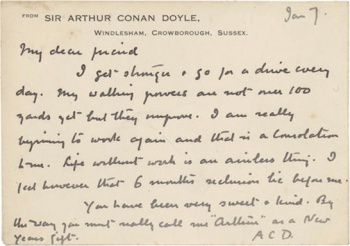 This notecard was written by Arthur Conan Doyle on 7 january 1930 from Windlesham, Crowborough. I get stronger and go for a drive every day. My walking powers are not over 100 yards yet but they improve. I am really beginning to work again and that is a consolation to me. Life without work is an aimless thing. I feel however that 6 months reclusion lie before me. You have been very sweet and kind. By the way you must really wall me "Arthur" as a New Year gift. This page was last edited on 8 November 2018, at 22:23.